Ghost of George Washington Appears! Seeing a full-bodied apparition is extremely rare, but getting a photograph of one is extraordinary. This is like catching the big one. Anyone can say they saw a ghost, but photographing one is like finding the Holy Grail. 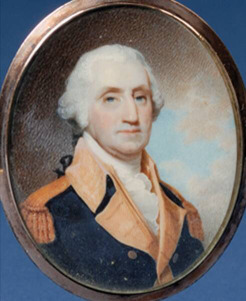 George Washington let himself be photographed for a reason. I know. I asked him. He’s giving validation – proof – that what I claim in Presidential Souls is true. I’m really communicating with the presidents and they are really with us. And they’re supporting and hanging around me. Ghosts abound in the historic city of Annapolis, Maryland. The Maryland State House is the oldest state capitol in the country and the only state house that served as the Nation’s Capital. Enjoy a tour with the author then lunch (or dinner) at Middleton Tavern in Annapolis. Middleton Tavern was established in 1750 and hosted famous patrons such as George Washington, Thomas Jefferson and Benjamin Franklin. I’ll ask the ghosts to come out and play if you join me for a visit! I’ll identify your Celestial Hat and provide an autographed copy of Presidential Souls. I hadn’t even asked the ghosts to come out and play yet, so I was shocked at the early reveal! They’re so anxious for us to acknowledge them that they’re taking matters into their own hands. Upon our arrival, we were seated at a table with pictures of George and Martha Washington looking down on us. Mentally, I said, “Hi George and Martha” and I was pleased that they were with us. I never expected to see the full form of George Washington! After a fantastic dinner, I was ecstatic when the manager asked if I wanted to perform a paranormal investigation of the Middleton Tavern! There have been numerous paranormal occurrences at the tavern, so we made the arrangements and I told him I could feel the Spirits in the restaurant. I didn’t see George Washington in the photograph until later that night. Normally, I don’t immediately download the photos from my IPhone, but despite the late hour, I felt compelled to do so. This is one of those moments when I realize later that I was being guided. The photograph is of a black figure. You can see an outline on the head of what looks like a wig worn in colonial times. You can also see a triangular-shaped jacket collar, which is similar to the portrait. The black figure is transparent. 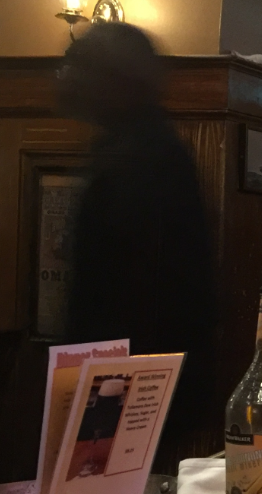 You can see the outline of the picture frame and other items through the black figure. I could see that this apparition was George Washington, but I also verified it with him. He is literally “coming out” to stress the message I’ve been giving, and I’ll keep giving. The presidents came forward in Presidential Souls and they want you to hear what they have to say.